The Met Breuer, former home of the Whitney Museum, is an example of Brutalist Architecture with its aggressive lines and thrusting bulk. The Met Breuer shown in the first photo couldn’t look more different than the Beaux-Arts design of the Met’s main building (above) a few blocks to the north. 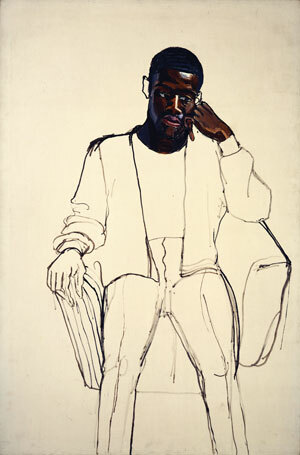 James Hunter Black Draftee, Alice Neel’s 1965 oil on canvas. COMMA Foundation, Belgium. Courtesy of David Zwirner, New York/London. ©The Estate of Alice Neel. 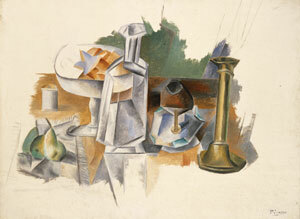 From Unfinished: Thoughts Left Visible, Pablo Picasso’s Carafe and Candlestick, an oil on canvas dated 1909. From the Leonard A. Lauder Cubist Collection. Courtesy of the Metropolitan Museum of Art. ©2015 Estate of Pablo Picasso/Artists Rights Society, New York. 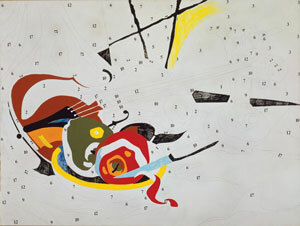 Do It Yourself (Violin) by Andy Warhol, from Unfinished: Thoughts Left Visible. Synthetic polymer paint and Prestype on canvas. 1962. Private collection. ©2015 The Andy Warhol Foundation for the Visual Arts Inc. Artists Rights Society, New York. 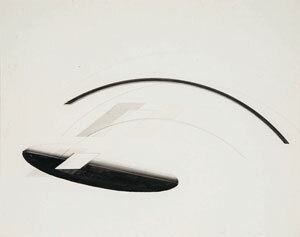 Untitled by Nasreen Mohamedi, ink and gouache on paper. Ca. 1975. Jayshree and Sanjay Lalbhai. From Nasreen Mohamedi. Courtesy of the Metropolitan Museum of Art. 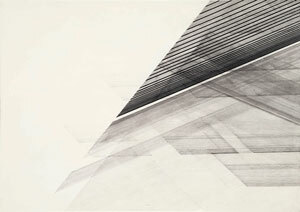 Untitled by Nasreen Mohamedi, ink and gouache on paper. Ca. 1975. Jayshree and Sanjay Lalbhai. Courtesy of the Metropolitan Museum of Art. Untitled by Nasreen Mohamedi. Ink and graphite on paper. ca. 1980. From the collection of the Dossal Family. Courtesy of the Metropolitan Museum of Art. The long view vs. the art of the moment. 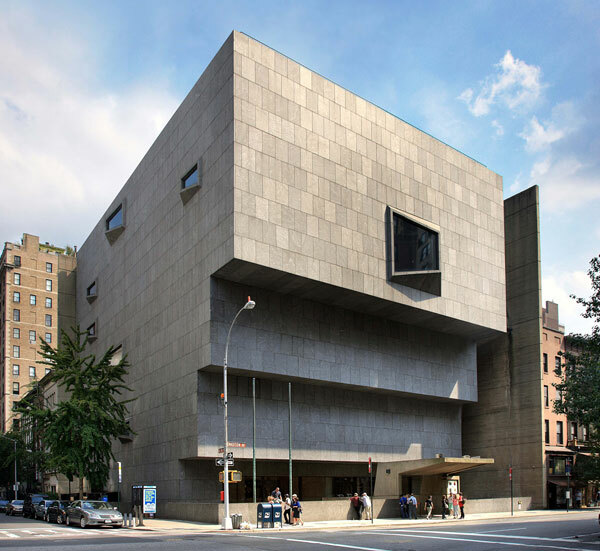 On March 18, the Metropolitan Museum of Art opened Met Breuer, its new branch of modern and contemporary art. The new branch is located a few blocks south of the main building in what was formerly the Whitney Museum. 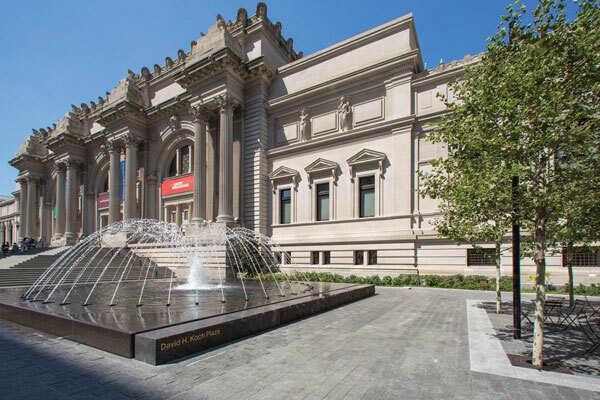 The Met now joins other New York art museums as a high-profile supporter of new art, something many boosters of the current art scene applaud. Finally, they say, America’s preeminent museum is embracing the art of its time! Finally, the Met is emerging from its myopic antimodernism and getting hip to what’s really happening! But is that really such a good thing? Over the years, others have counted on the Met to take the long view of art history, to be the one institution that refuses to cave in to the art of the moment. We live, after all, in an age when no one even agrees on what art is. Styles come and go with shocking rapidity. If, as some insist, “art” is now anything that “an artist” says it is, curators—those trained to make judgments of quality—have a nearly impossible job. Where do they draw the line? Galleries don’t have to draw such lines. Nor do art fairs, art expos, alternative spaces, kunsthalles and international biennials. The point being that there is no shortage of places displaying contemporary art, all of which pride themselves on being wide open to art of a new and experimental nature. But museums, as I understand the term, play a different role in our culture. Traditionally, they have been places where the very best art of the past is saved, preserved and explained. Perhaps this sounds quaint when cities all over the world have “museums of contemporary art,” but to me, the term is oxymoronic. Think of the history of art as a pyramid. At the top of the pyramid are the oldest works of art—a handful of cave paintings that are 40,000 years old. As you descend the pyramid, the works become more and more numerous. There are plenty of French impressionist paintings out there, for example. They may not all be masterpieces, but they are not in short supply. The same is true of America’s Hudson River School, or 1950s abstraction when just about every artist in New York City was trying to emulate Jackson Pollock or Willem deKooning. At the base of the pyramid are works produced by today’s artists. They are beyond numerous. You could probably fill the entire Metropolitan Museum with a day’s output from this global cohort (and there are plenty who would probably think this a good idea). A museum like the Metropolitan is faced with a winnowing process. It’s not a democratic thing. Certain historic periods and places are judged to have produced greater works of art than others: the Italian Renaissance, the Dutch Golden Age, 19th century France. In addition, after hundreds of years, certain giants emerge who represent their age—a Rubens, a Velasquez, a Goya, a Delacroix, a Monet or a Van Gogh. How does this happen? 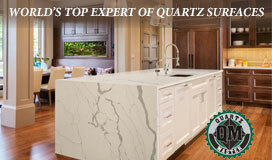 Over years or centuries, the judgments of scholars, curators, and collectors create a consensus. It’s the test of time. The closer you get to the present moment, the harder it is to judge and the less consensus there is. Today, we can look back a century or so and agree that Cezanne and Van Gogh were great artists. We can look back 500 years and say the same about Leonardo or Michelangelo. Will people a hundred or 500 years from now look back with the same admiring wonder at Damien Hirst’s shark in a tank of formaldehyde or Jeff Koons’ stainless steel balloon poodle? Surely, the art historical jury is still out on these artists. In fact, it could be argued that the real jury hasn’t even convened. The major museums that give big play to contemporary art in New York City today include the Museum of Modern Art, the Whitney, the Guggen­heim and the New Museum of Contem­porary Art. But the Metropolitan is not just another New York museum. It’s probably the greatest museum in the world with an encyclopedic collection covering 5,000 years of human history. And the Met has hardly ignored new art. It has long had a Department of Modern and Contemporary Art. Since 1987, these works have been housed in the Lila Acheson Wallace Wing. The collection has its holes and can’t possibly match that of MoMA— with its heaps of Picassos and Matisses and examples of every modernist “ism” from the 20th century. But so what? Why should the Met duplicate the holdings of a specialist museum that is only a subway ride away? I doubt many visitors come away from the Met’s masterpieces grumbling that they didn’t see enough contemporary art. Under the long tenure of former Director Phillipe de Montebello, the Met took a decidedly cautious stance with regard to contemporary art. De Montebello was unapologetic about this. He never denied accusations that he was “an elitist.” He presided over an elite collection, as he saw it, and wanted to keep it that way. But de Montebello retired in 2009 and was replaced with the much younger Thomas P. Campbell, whose background gave no hint that he was a cutting-edge personality. Quite the opposite. He spent 14 years as the Met’s curator of European tapestries and textiles, a decidedly dry and scholarly field. Campbell, who is British, brings a cultured accent to the job, as did the French-born de Montebello— a big plus when it comes to hosting black-tie events and recording audio guides. Unlike de Montebello, however, he has shown a surprising enthusiasm for the art of the moment. Behind his desk, where you might expect to see a Renaissance or Baroque tapestry, hangs instead a decidedly ironic work, Warhol’s silkscreen of the Mona Lisa. Campbell dates his conversion to the transition period before taking over as director. Then, he told an interviewer, he gave himself a crash course in contemporary art. He went to galleries, art fairs, biennials and auctions and spoke with artists, dealers and curators. While acknowledging that contemporary art has become a commodity for investment and speculation by the rich and super-rich, he nevertheless believes a “neo-Renaissance” is taking place in which the Met should play a part. He has launched a multimillion-dollar drive to make modern and contemporary art one of the Met’s primary attractions. As part of the plan, he wants to raise funds to demolish the Wallace Wing and replace it with a new wing to be designed by British architect David Chipperfield. This could take a while. For now, however, the showcase for the Met’s new priorities is Met Breuer, on which it now holds an eight-year lease. This, the Whitney’s old home, was designed by modernist architect Marcel Breuer and is an example of what is called “Brutalist Archi­tecture.” Its aggressive lines and thrusting bulk couldn’t look more different than the Beaux-Arts design of the Met’s main building a few blocks to the north. It’s what goes into this empty shell, however, that may redefine the Metropolitan Museum’s traditionalist personality. Enter British curator Sheena Wagstaff, who Camp­bell brought over from the very cutting-edge Tate Modern in London. She has totally remade the department, pushing out the previous staff and replacing it with seven curators of her own choosing. Wagstaff’s tastes lean toward conceptual and non-western art. Both interests have been evident in shows she has curated for the Met’s scenic rooftop sculpture garden. In one, Pakistani artist Imran Qureshi splattered red paint across the stone floor, a gesture meant to evoke the bloody violence that has unfolded across the globe in recent years. In another, a French conceptual artist installed a fish tank stocked with lampreys and removed some of the roof’s paving stones so weeds could grow up out of the soil underneath. The inaugural shows at Met Breuer, located on Madison Avenue at 75th Street, are not quite so radical. Unfinished: Thoughts Left Visible is a 550-year survey of incomplete art. The idea behind the show is very conceptual—that art is about ideas and process and not so much finished objects. But it does this by setting up a dialogue with Old Master works—including those by Titian, Leonardo, Rubens, Rembrandt and Velázquez—as well as those by modernist masters such as Picasso and Matisse. 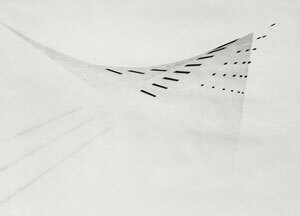 The other show, Nasreen Mohamedi, is a retrospective devoted to an Indian modern artist who died 20 years ago and was known for minimalist grids and other austere, linear pieces. Half of the Met’s 38 trustees are collectors of contemporary art, as are many potential donors. These art-political facts are undeniably a motive in the Met’s new enthusiasm for the art of the now. At the same time, it should be recognized that making contemporary art a big draw at the Met puts its reputation and identity—or in current language, its “brand”—at risk. Art history is tricky. Sometimes the best artists go completely unrecognized in their times while the ones who are championed are forgotten by posterity. And not every period produces memorable art. Little of any value came out of 16th and 17th century England, for example. The same could be said of 17th to 19th century Germany. It’s tempting to believe that you live in a golden age, but the odds are very much against it. In truth, 99.99 percent of all the art created is forgotten, discarded or judged worthless in monetary value. Art dealers don’t like to talk about this, and collectors of contemporary art certainly don’t like to think about it, but it’s the job of great museums and their curators to keep this forever in mind.